Point Lookout State Park is a Maryland state park occupying Point Lookout, the southernmost tip of a peninsula formed by the confluence of Chesapeake Bay and the Potomac River in St. Mary's County, Maryland. The state park preserves the site of an American Civil War prisoner of war camp and the Point Lookout Light, which was built in 1830. It is the southernmost spot on Maryland's western shore, the coastal region on the western side of the Chesapeake Bay. 2.1 Origin of area name, "Point Lookout"
Captain John Smith, the famed explorer who surveyed the Mid-Atlantic region for the British Crown, came ashore at Point Lookout in 1608. He surveyed the lands and waters of the area, including the mouth of the Potomac River on the south side of Point Lookout and its small nearby tributary, the St. Mary's River. Smith gave very favorable reports on the area to the king of England, remarking on the abundant game and fishing opportunities, the fertile soil and the strategic military value of the area, overlooking the confluence of the Potomac River, Patuxent River and the St. Mary's River, along with its key vantage point on the Chesapeake Bay itself. All of these factors led him to describe it as a prime spot for a potential British colony. Royal Marines were stationed at Point Lookout during the British occupation in 1814 of the Chesapeake Campaign in the War of 1812. 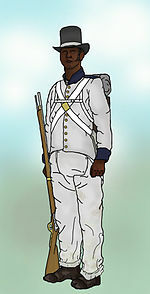 British Colonial Marines of the Corps of Colonial Marines were stationed at Point Lookout during the British occupation in 1814 of the Chesapeake Campaign in the War of 1812. Origin of area name, "Point Lookout"
During the War of 1812 the Chesapeake Bay was a major route for British War ships, who established a naval and military base at near-by Tangier Island in Virginia for the Royal Navy under Rear Admiral George Cockburn with Fort Albion there, which constantly raided Chesapeake Bay waterfront towns, villages and farms and scattered community residents, and also eventually attacked and burned Washington D.C. and unsuccessfully attacked the City of Baltimore during 1813 and 1814. The citizen militia worked clandestinely in the area for over a year, until the British came ashore, seized and occupied Point Lookout. The militia was no match for the overwhelming power and number of seasoned British ground troops. This had the effect of blinding American intelligence efforts in the region, and is thought to have contributed to the eventual Burning of Washington in August 1814 by British troops. President Madison and United States Secretary of War, John Armstrong, Jr. was later faulted for not aiding the militia in Point Lookout. Sidney Lanier, noted poet, musician and academic, was a Confederate prisoner in the Union Army prison camp, at Point Lookout, Maryland. Point Lookout prisoner of war camp historical marker at Point Lookout, Maryland. In 1862, during the American Civil War, much of the land around Point Lookout was transformed into a bustling port and temporary city of civilians and military personnel and numerous buildings, including a large Union Army hospital, a United States Army garrison at Fort Lincoln, and a Union prisoner of war camp to hold Confederate States Army soldier captives. Federal Confederate Cemetery Memorial plaque, over the site of a mass grave [ dubious – discuss] of 3,384 Confederate soldiers, Point Lookout Maryland. Today, a Confederate prisoner of war memorial and cemetery exist on the former grounds of the Point Lookout prisoner of war camp. The mass grave  holds 3,384 Confederate prisoners of war who died at the prison camp. The grave is marked by a pillar inscribed at its base with the names of the dead. The privately funded Confederate Memorial Park occupies a three-acre site next to the cemetery. Although a United States flag is flown in front of the memorial, a prominent Confederate flag is situated on a flagpole just outside the gates of the grounds, in memory of those dead Southern soldiers. Sidney Lanier, poet, musician, and academic was a Confederate prisoner of war at Point Lookout. ^ a b "Point Lookout State Park". Geographic Names Information System. United States Geological Survey. ^ "Fiscal Year 2016 DNR Owned Lands Acreage" (PDF). Maryland Department of Natural Resources. July 29, 2016. Retrieved January 2, 2017. ^ "Maryland State Park History". Maryland Department of Natural Resources. Retrieved November 7, 2017. ^ a b c "Point Lookout State Park". Maryland Department of Natural Resources. Retrieved November 24, 2014. ^ a b c "Point Lookout History". Maryland DNR. Retrieved November 24, 2013. ^ Hoobler, Dorothy; Hoobler, Thomas (2006), Captain John Smith: Jamestown and the Birth of the American Dream, Hoboken, NJ: John Wiley & Sons, Inc., pp. 153–159, 212–213, ISBN 978-0-471-48584-1 . ^ Grizzard, Frank E.; Hoobler, Thomas (2006), Jamestown Colony: A Political, Social and Cultural History, Santa Barbara, CA: ABC-CLIO, pp. 203–207, ISBN 978-1-85109-637-4 . ^ Peter Himmelheber; Philip Davis; Linda Davis Reno (October 2002). "St. Mary's County, Maryland: Proprietary Manors". St. Mary's Families. Retrieved December 26, 2013. ^ a b c d e f g h i j "Point Lookout Confederate Cemetery: Ridge, Maryland". National Park Service. ^ "Point Lookout State Park: The Cavalry and the Pony Express". The Southern Maryland Historic Horse Trail, a program of the Southern Maryland Agricultural Development Commission. Retrieved January 2, 2017. ^ "Point Lookout Confederate Cemetery". U.S. Department of Veterans Affairs. Retrieved December 26, 2013. ^ "Point Lookout Prison Camp Records". University of Michigan. Archived from the original on February 26, 2005. Retrieved December 26, 2013. ^ "Prison History". Descendants of Point Lookout POW Organization. Retrieved December 26, 2013. ^ "Point Lookout Prisoner of War Camp". The American Civil War. mycivilwar.com. Retrieved December 26, 2013. ^ Ken Stover. "Civil War Prison Camps". Civil War Academy.com. Retrieved December 26, 2013. ^ Brenda Smelser Hay. "Point Lookout Prison in the Civil War". Retrieved December 26, 2013. ^ "Point Lookout Confederate Cemetery". Find a Grave. Retrieved December 26, 2013. ^ "Point Lookout Confederate Cemetery". Interment.net. Retrieved December 26, 2013. ^ "Confederate Memorial Park". Confederate Memorial Park, Inc. Retrieved December 26, 2013. ^ Brudvig, Erik (2009-05-19). "Aliens Invade Fallout 3". IGN. Archived from the original on 2011-07-21. Retrieved 2009-05-19. Wikimedia Commons has media related to Point Lookout State Park.